American orbital launch vehicle. Titan 3D with Centaur D-1T upper stage. Used by NASA for deep space missions in 1970's. AKA: SLV-5E;Titan 23E;Titan 3E. Status: Retired 1977. First Launch: 1974-02-11. Last Launch: 1977-09-05. Number: 7 . Payload: 15,400 kg (33,900 lb). Thrust: 10,586.80 kN (2,380,007 lbf). Gross mass: 632,970 kg (1,395,450 lb). Height: 48.00 m (157.00 ft). Diameter: 3.05 m (10.00 ft). Apogee: 185 km (114 mi). LEO Payload: 15,400 kg (33,900 lb) to a 185 km orbit. Payload: 3,700 kg (8,100 lb) to a trans-Mars trajectory. Launch Price $: 72.500 million in 1974 dollars. Stage 0. 2 x Titan UA1205. Gross Mass: 226,233 kg (498,758 lb). Empty Mass: 33,798 kg (74,511 lb). Thrust (vac): 5,849.411 kN (1,315,000 lbf). Isp: 263 sec. Burn time: 115 sec. Isp(sl): 238 sec. Diameter: 3.05 m (10.00 ft). Span: 3.05 m (10.00 ft). Length: 25.91 m (85.00 ft). Propellants: Solid. No Engines: 1. Engine: UA1205. Status: Out of Production. Stage 1. 1 x Titan 3A-1. Gross Mass: 116,573 kg (256,999 lb). Empty Mass: 5,443 kg (11,999 lb). Thrust (vac): 2,339.760 kN (525,999 lbf). Isp: 302 sec. Burn time: 147 sec. Isp(sl): 250 sec. Diameter: 3.05 m (10.00 ft). Span: 3.05 m (10.00 ft). Length: 22.28 m (73.09 ft). Propellants: N2O4/Aerozine-50. No Engines: 2. Engine: LR-87-11. Status: In Production. Stage 2. 1 x Titan 3A-2. Gross Mass: 29,188 kg (64,348 lb). Empty Mass: 2,653 kg (5,848 lb). Thrust (vac): 453.714 kN (101,999 lbf). Isp: 316 sec. Burn time: 205 sec. Isp(sl): 145 sec. Diameter: 3.05 m (10.00 ft). Span: 3.05 m (10.00 ft). Length: 7.90 m (25.90 ft). Propellants: N2O4/Aerozine-50. No Engines: 1. Engine: LR-91-11. Status: In Production. Stage 3. 1 x Centaur D/E. Gross Mass: 16,258 kg (35,842 lb). Empty Mass: 2,631 kg (5,800 lb). Thrust (vac): 131.222 kN (29,500 lbf). Isp: 444 sec. Burn time: 470 sec. Diameter: 3.05 m (10.00 ft). Span: 3.05 m (10.00 ft). Length: 9.60 m (31.40 ft). Propellants: Lox/LH2. No Engines: 2. Engine: RL-10A-3. Status: Out of Production. Family: orbital launch vehicle. Country: USA. Engines: RL-10A-3, LR87-11, LR91-11. Spacecraft: Sphinx, Viking, Helios, Voyager. Launch Sites: Cape Canaveral, Cape Canaveral LC41. Stages: Titan 3A-1, Titan 3A-2, Centaur D/E, UA1205. Agency: Martin. 1971 June 1 - . LV Family: Titan. Launch Vehicle: Titan IIIE. Go ahead for two Titan Ill/Centaur launch vehicles. - . 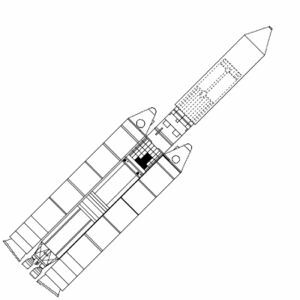 The Martin Marietta Corporation was given the go ahead to build two Titan Ill/Centaur launch vehicles. This included authority to design, build, and install required aerospace ground equipment (AGE) to activate Eastern Test Range Launch Complex 41 in support of NASA Titan Ill/Centaur missions. 1973 June 22 - . LV Family: Titan. Launch Vehicle: Titan IIIE. Air Force accepted the first Titan IIIE. - . The Air Force accepted the first Titan IIIE (E-1) from the Martin Marietta Corporation. The vehicle was then shipped to the Eastern Test Range for final assembly, checkout, and mating with Centaur upper stage prior to the planned proof launch in January 1974. SAMSO procured the Titan HIE, a Titan HID modified to accept a Centaur upper stage, for NASA's use in its Viking Mars Lander program and other future projects. 1973 October 15 - . LV Family: Titan. Launch Vehicle: Titan IIIE. NASA buys three additional Titan HIE vehicles - . NASA decided to procure three additional Titan HIE (Titan/Centaur) launch vehicles for future space missions..
1974 February 11 - . 13:48 GMT - . Launch Site: Cape Canaveral. Launch Complex: Cape Canaveral LC41. LV Family: Titan. Launch Vehicle: Titan IIIE. FAILURE: Centaur LOX pump failure.. Failed Stage: U.
Sphinx - . Nation: USA. Agency: USAF. Spacecraft: Sphinx. Decay Date: 1974-02-12 . Space Plasma High Voltage Interaction Experiment. Payload carried on test flight of Titan 3E booster..
1974 December 10 - . 07:11 GMT - . Launch Site: Cape Canaveral. Launch Complex: Cape Canaveral LC41. LV Family: Titan. Launch Vehicle: Titan IIIE. Helios 1 - . Mass: 370 kg (810 lb). Nation: Germany. Agency: DFVLR. Class: Astronomy. Type: Solar satellite. Spacecraft: Helios. USAF Sat Cat: 7567 . COSPAR: 1974-097A. A Titan IIIE/Centaur launched from Cape Canaveral boosted the United States-West German HELIOS spacecraft into heliocentric orbit as a solar probe to investigate the properties and processes of solar/terrestrial relationships. This was the first completely successful flight of the Titan IIIE/Centaur booster combination. Solar probe. Solar Orbit (Heliocentric). Launched by the United States and the Federal Republic of Germany. Helios A (Helios I). Heliocentric orbit 190 days, 0.309 x 0.985 AU x 0 deg. Exploration of the interplanetary space between the earth and the sun and study of solar influences on that area. 1976 January 15 - . 05:34 GMT - . Launch Site: Cape Canaveral. Launch Complex: Cape Canaveral LC41. LV Family: Titan. Launch Vehicle: Titan IIIE. Helios 2 - . Mass: 376 kg (828 lb). Nation: Germany. Agency: DFVLR. Class: Astronomy. Type: Solar satellite. Spacecraft: Helios. USAF Sat Cat: 8582 . COSPAR: 1976-003A. A Titan HIE carrying a West German Helios payload was successfully launched from LC-41, Eastern Test Range. Solar probe. Solar Orbit (Heliocentric). Spacecraft engaged in practical applications and uses of space technology such as weather or communication (US Cat C). 1977 August 20 - . 14:29 GMT - . Launch Site: Cape Canaveral. Launch Complex: Cape Canaveral LC41. LV Family: Titan. Launch Vehicle: Titan IIIE. Voyager 2 - . Payload: Voyager 2 [Star-37E]. Mass: 800 kg (1,760 lb). Nation: USA. Agency: JPL. Class: Outer planets. Type: Outer planets probe. Spacecraft: Voyager. USAF Sat Cat: 10271 . COSPAR: 1977-076A. A Titan HIE launched NASA's Voyager I spacecraft from Cape Canaveral, Florida. Jupiter flyby 7/9/79, Saturn flyby 8/26/81, Uranus flyby 1/24/86, Neptune flyby 8/25/89. Solar system escape trajectory. Spacecraft engaged in research and exploration of the upper atmosphere or outer space (US Cat B). 1977 September 5 - . 12:56 GMT - . Launch Site: Cape Canaveral. Launch Complex: Cape Canaveral LC41. LV Family: Titan. Launch Vehicle: Titan IIIE. Voyager 1 - . Payload: Voyager 1 [Star-37E]. Mass: 800 kg (1,760 lb). Nation: USA. Agency: JPL. Class: Outer planets. Type: Outer planets probe. Spacecraft: Voyager. USAF Sat Cat: 10321 . COSPAR: 1977-084A. A Titan HIE launched NASA's Voyager I spacecraft from Cape Canaveral, Florida. Jupiter flyby 3/5/79, Saturn flyby 11/12/80. Solar system escape trajectory. Spacecraft engaged in research and exploration of the upper atmosphere or outer space (US Cat B)..